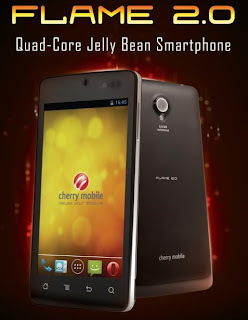 This coming April 2013, Cherry Mobile will released the Cherry Mobile Flame 2.0, the first CM's Quad-core smartphone powered by a Snapdragon processor, according to report by Yugatech site. Cherry Mobile Flame 2.0 is come with a dual-SIM feature and with a 4.5-inch qHD capacitive touch display. And surely you'll be happy for the 1GB size of RAM and runs Android 4.1.2 Jellybean. According to Yugatech, Cherry Mobile Flame 2.0 will be available in the first or second week of April. For the meantime, if you like the information about Cherry Mobile Flame 2.0 Specifications, please bookmark this page and share it to your friends on Facebook, Twitter and Google+. Comments or suggestions about "Cherry Mobile Flame 2.0 Quad-core at Php6,990" is important to us, you may share it by using the comment box below.